The European Alps arose as a result of the collision of the African and European tectonic plates. The mountains are made of limestone, formed from sediments deposited in the ancient Tethys Ocean basin about 200 million years ago, during the time of the dinosaurs. The Tethys separated the ancient supercontinents Laurasia (which included modern-day Europe) and Gondwana (which included modern-day Africa & Australia), until the African plate began to push northward into the Eurasian plate around 30 million years ago. That closed the Tethys sea and lifted the sea floor up, forming the Alps. The intense tectonic forces created massive recumbent folds in the limestone, called ‘nappes’, which were then carved extensively by glaciers over the past 2 million years to form the extreme peaks and valleys seen today. Crystalline basement rocks, which are exposed in the higher central regions, are the rocks forming Mont Blanc, the Matterhorn, and high peaks in the Pennine Alps and Hohe Tauern in Austria. The geology of the Mont Blanc area is a product of the the dynamic and complex geology of the Alps as a whole. Around the fringes of the mountain and then many of the areas where TMB walkers will find themselves a rock faces are principally limestone and schist. Things are the results of a rock building process that took place of 700 million years ago. The Mont blanc massif and the Aiguille Rouge are composed of granites which pushed through the older rocks some 300 million years ago. The actual tectonic process of mountain building began about 100 million years ago when the African and European plates collided and forced these rocks upwards. This period of mountain building in the Alps this thought to have ended 6 million years ago and since then the effect of successive periods of glaciation have created the land forms we see today. However Alpine glaciers are currently in rapid retreat and have been for over a century. 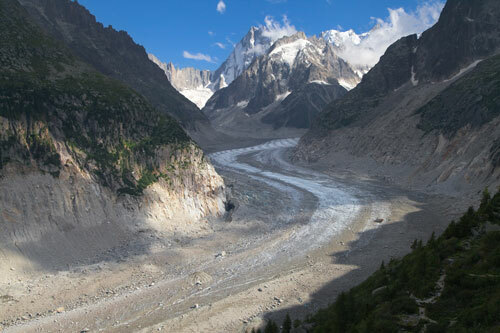 In 1645 Bishop of Geneva perform the exorcism at the snout of the Mer de Glace after it had bulldozed through chalets and farmland in the Chamonix valley. 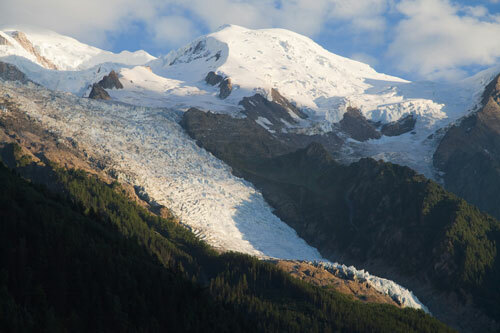 The glacier, which is the second longest in the Alps has since then retreated several kilometers. massif: a large block of rock or other structural feature within an orogenic belt that is usually older and more rigid than the surrounding rocks.